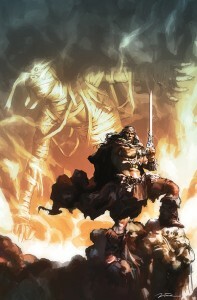 DARK HORSE COMICS TO PUBLISH KING CONAN: THE HOUR OF THE DRAGON! February 1, MILWAUKIE, OR – Dark Horse Comics is thrilled to announce the return of a fan-favorite Conan creative team. Writer Timothy Truman, artist Tomás Giorello, and colorist José Villarrubia are set to adapt Robert E. Howard’s only Conan novel in two six-issue miniseries. For a sneak peak at the variant cover and a full-color interior page, check out the exclusive on MTV Geek <http://geek-news.mtv.com/2013/01/29/exclusive-new-king-conan-hour-of-the-dragon-comic/> ! King Conan: The Hour of the Dragon #1 is on sale in comic stores everywhere May 29! This entry was posted in Columns and tagged alternative comics, DARK HORSE COMICS, jose villarrubia, king conan, Robert E. Howard, the hour of the dragon, the phoenix on the sword, the scarlet citadel. Bookmark the permalink. Follow any comments here with the RSS feed for this post. Post a comment or leave a trackback: Trackback URL.